The exceptional natural setting makes The Homestead the perfect resort for romantic getaways, family vacations, family reunions, weddings, meetings and vacation and retirement homes. When you visit, you’ll discover beaches on which you can walk for hours without interruption. They will make your day soothing in spring and summer, invigorating come fall and winter, your evening remarkably romantic year-round. The Homestead is located on the shore of Lake Michigan’s Manitou Passage across the bay from Sleeping Bear Dunes, the largest moving dunes in the world. The Dave Pelz Scoring Game School applies a practical, yet scientific approach to golf instruction inside of 100 yards from the hole. Pelz, the physicist turned golf researcher and teach, has helped golfers of all ability levels lower their scores. Countless amateurs attest to that. So do leading professionals Beth Daniel, Lee Janzen, Phil Mickelson, Se Ri Pak, Vijay Singh, Annika Sorenstam and Mike Weir! Play our stunningly beautiful Par 3 or at one of the courses which offers our members and guest preferred rates — Manitou Passage Golf Culb, Champion Hills, Pinecroft Golf Plantation and Mistwood. Manitou Passage Golf Course an Arnold Palmer signature course was redesigned by Palmer and rebuilt to become a destination course. It now offers five traditional tee boxes, strategically placed hazards, lush fairways and exceptional greens in one of the region’s most spectacular natural settings. To complement that, there’s unmatched service on the course and in the all-new clubhouse. 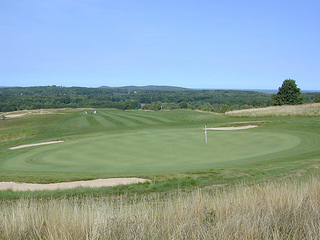 The course is located just south of the Manitou Passage on M-22 between Glen Arbor and Leland. Quietly, Spa Amira invites you to a ridge high above Lake Michigan. When you visit, you’ll enjoy commanding views of the Sleeping Bear Dunes and the Manitou Islands while being engaged in a captivating interlude with one of America’s most treasured natural environments. That tranquil feeling will allow you to relax and enjoy extensive outdoor spaces including terraces, gardens, waterfalls, a fireplace, labyrinth and pool. Those spaces and the views from them create a serene and welcoming retreat that’s far, far away from the everyday. Of Fish, Ponds and Meetings – You and we know the adage. We also know that small meetings get swallowed up when a large meeting lurks in the same pond. That’s why we designed five small ponds and invite you to call one your own. We’ll stock your pond with all the supplies and refreshments you’ll need. So you’ll enjoy quiet waters and won’t get hooked with extra charges. When the work day’s done, you can be in, along or above a really big pond, Lake Michigan – here or in the adjoining Sleeping Bear Dunes National Lakeshore. You’re invited! You’re invited to enjoy summer days and nights doing as much or as little as you like. You could just listen to the water and walk on the beach, or hike or bike, swim, play golf or tennis, kayak, wind surf – or even kite surf! You could enjoy a Dave Pelz Scoring Game School or Orvis Michigan Fly Fishing School or a Great Lakes Photo Tour. You could take in a concert at the Interlochen Center for the Arts or Manitou Music Festival or a movie at the Traverse City Film Festival. To learn more about activities in the area, visit Explore the Destination, www.sleepingbeardunes.com and www.nps.gov/slbe. Put the Blackberry away. Get away for a romantic weekend or for a family weekend. Rediscover skating, downhill skiing, cross-country and snowboarding. For a new adventure try snowshoeing. Go with an instructor or a guide, or without. Let the kids go to camp. Work out at the new health and fitness center. Refresh at the spa. Enjoy a beverage thatï¿½s cold outside and warm inside. Taste, really taste a meal sitting by a crackling fire. Play a game or read a book. So come for a visit. You’ll be refreshed and restored. And you and your special someone – or you and your kids – will have memories, wonderful memories, to take with you. You might even win a vacation!